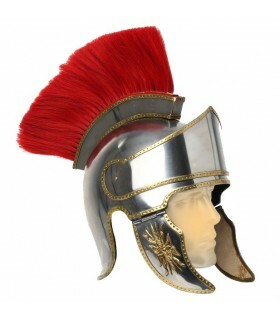 Roman Helmets There are 24 products. 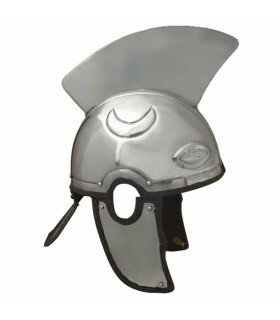 Penacho for Roman helmet. It is attached to the hull by leather cords. 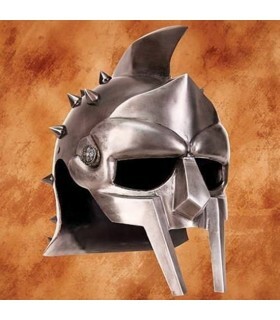 To place it on the helmet support is needed. Feathers measured 10.5 cm. 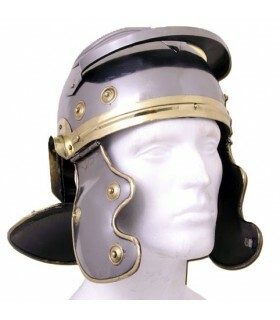 Roman helmet made of premium leather with metallic trim front and rivets. It is adjustable from behind with a cord of the same skin. 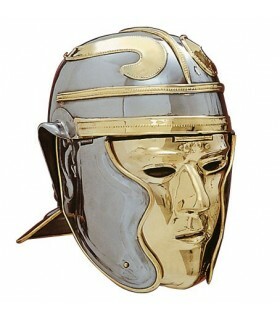 Imperial Roman helmet with mask. The original is exhibited at the Museum Shelby White Collection in New York. Head circumference up to 62 cms. 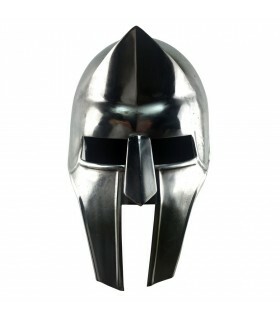 Roman Gladiator Helmet Maximus based on the character that appeared in the film Gladiator starring Russell Crowe. 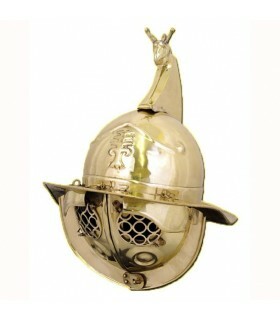 Roman helmet Spangenhelm that appeared in Egypt and is dated in the first half of the fourth century after Christ. Made with steel plates of 1.6 mm. thick joined with rivets. The interior comes with fabric lining and straps and buckle to fit the neck. 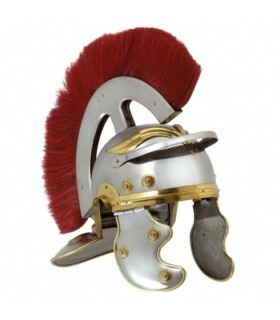 Helmet Roman Centurion Toe with red plume provisions frontally. natural and functional size. 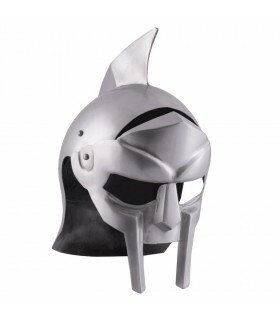 It includes removable helmet with panache and interior padding. 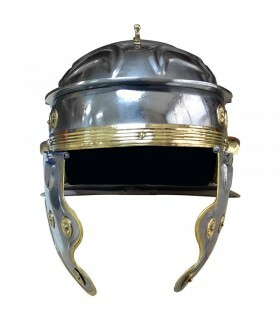 Imperial Roman helmet replica Gálico. The original hull was found near Weiseneau, Germany. It includes padding. One size, approx. 60 cms. 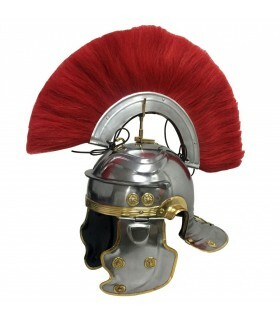 Roman Centurion helmet of the last epoch, III-IV century d. C. Made of Steel and edged in leather. The original was found in Intercisa - Hungary. Perimeter: 61 cms./ li>Distance from front to back: 20.5 cms./ li>From ear to ear: 18.5 cms. 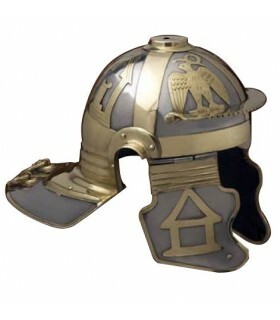 Roman helmet of Infantry used in Century III d. C. The hull consists of 4 segments made of steel and is hemmed and with leather closures. 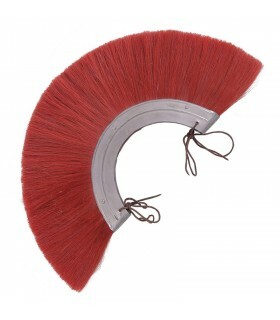 The original was found in the ancient Roman fort of Burgh, a castle located in Norfolk, England. Perimeter: 62 cm li>From front to back: 22.5 cms./ li>From ear to ear: 19.7 cms. 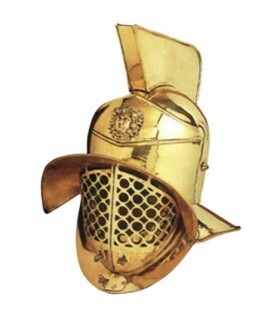 Casco Centurión Romano made of steel and brass, based on those found in 300 BC in Athens. The protections of the cheeks are covered in leather on the inside. Includes padding. 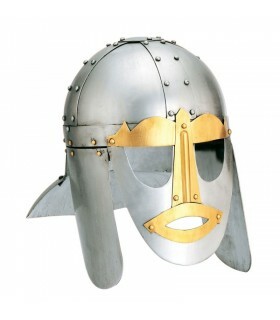 Replica of Romano archer's helmet made of steel and brass. 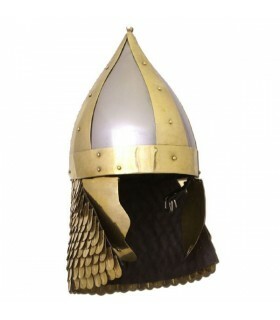 The neck protection is made of brass scales. 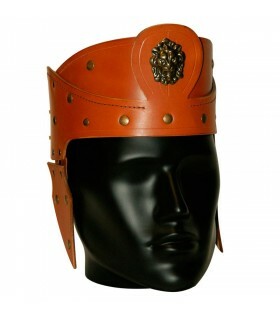 Includes high quality leather chin strap. 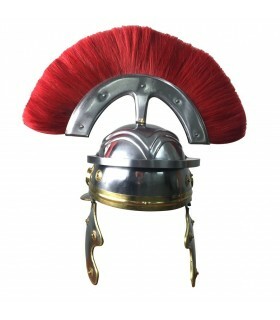 The helmet has a circumference of 60 cms. approx. 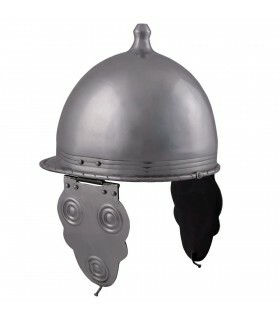 Replica of the famous helmet used in sand by the Thracian gladiators. 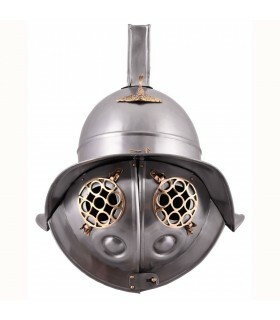 The helmet is made of high quality steel and with brass decorations. 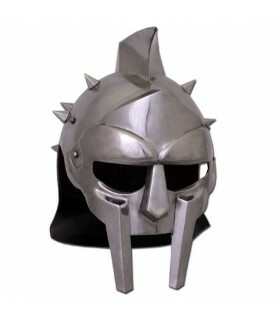 The product is composed of two parts: the helmet and the face protection that is attached to the helmet with 3 hinges .. The helmet has a circumference of 72 cm. 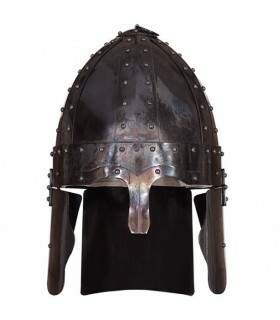 The Thracian helmet is a very faithful replica of the original of Pompeii (79 BC) It is made of brass and has an inner circumference of 63 cms. 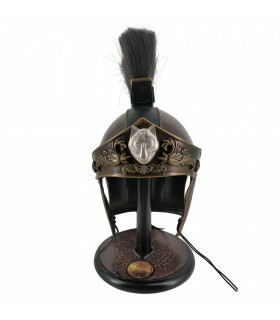 Casco Montefortino, 4th century BC C.
Montefortino helmet used by the Roman legionaries in the 4th century BC. C. Made of 1.2 mm steel. thick. 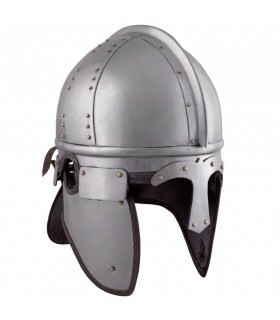 This helmet was the predecessor of the Roman helmet type Galician Imperial. Includes padding. Circumference (perimeter): 61 cm. li>Distance.- back-forward: 21 cms. li>Distance.- Ear-ear: 18.5 cms.